Here at William de Percy, four-legged friends are a big deal and as a dog-friendly pub and restaurant ourselves we know how important pet-friendly service is to our customers. There is nothing quite like a stroll around the Northumberland countryside or coastline with your prize pooch by your side! And, what better than breaking up your day up with a spot of lunch and well-deserved tipple in a dog-friendly pub.  If you are in the market for an escape to the Northumberland countryside don’t leave your furry friend behind, because here at the William De Percy Coaching Inn and Crêperie our door is always open to man’s best friend. From Dachshunds to Dalmatians, big or small, we love them all and we make sure there’s always room at the Inn for them. We would even go as far to say we are one of the best places to visit in Northumberland with a dog! However, here at William De Percy, we like to give our fellow Northumberland neighbors a chance, so here are our other top picks of pet-friendly pubs in Northumberland…. The Joiners Arms is set half a mile back from the sandy North Sea between Embleton and Bamburgh. This coastal stretch is well acclaimed for its spectacular scenery, awarded recognition as a National Trust Area of Outstanding National Beauty (ONB). The spot boasts 5 boutique bedrooms and is widely renowned for its scrummy gastro pub grub. Hold up! It gets better because you can enjoy all this with your pup by your side as the Joiners Arms is pet-friendly approved! The Sun Inn is a 10-minute walk from the beautiful Alnmouth Bay and makes for a cosy, intimate space to take cover from the British weather. The pub also offers a wide range of lagers, stouts and beers making for a perfect waterhole for a thirsty walker. Furthermore, The Sun Inn chefs take advantage of their coastal heritage, using locally-sourced seafood such as wild salmon, lobster, crab and mussels, to create inspiring dishes. What’s more, this seaside treasure is dog-friendly and the accommodating staff will be sure to make your pup feel right at home in front of the roaring fire. Overlooking Seahouses’ harbour, and with views across to the Farne Islands, the Bamburgh Castle Inn is a short five-minute walk from Bamburgh beach, making it an ideal location for a seaside lunch. The spot boasts a seasonal menu of hearty, traditional pub dishes and indulgent desserts – go on treat yourself! It is also a great place for families, and that means the whole family as even your fur babies are welcome. If you get lucky with the weather, the beer garden at the back of the inn has some fabulous views, it’s not one to be missed! Of course, it has to be said that William De Percy tops the charts of dog-friendly pubs Northumberland (we promise we aren’t biased)! We guarantee to provide for your dogs needs as well as your own to give you the perfect day out. If it sounds up your street, give us a call and book today for an experience you won’t regret! Bonus….Did you know that as well as being a dog-friendly pub and restaurant we even have three dog-friendly hotel rooms so you can stay the night and explore more of Northumberland with your pooch! Yes, we really do it all!